The last week we saw the US giant Walmart being used for another phishing scam attempt. We have intercepted a number of emails purporting to be from Walmart. 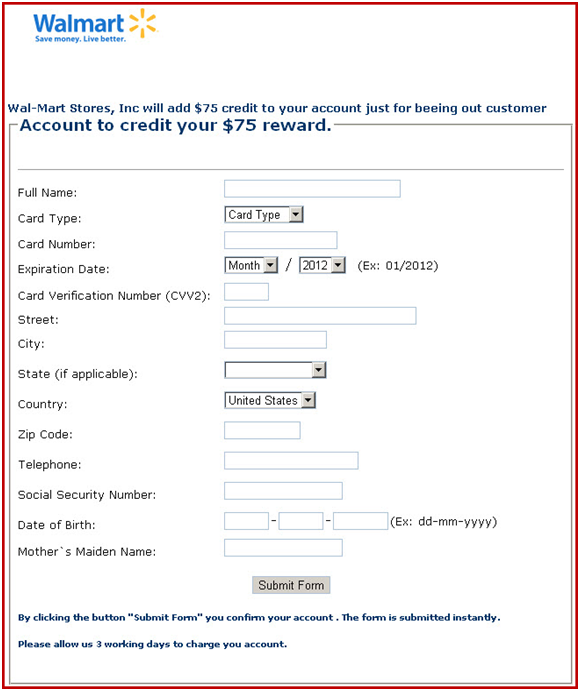 The email claiming to be from Walmart and the recipient has been selected to receive a prize of $75 just for being a customer of the company.The email contains an HTML attachment.Users are instructed to “download” the attached form and fill it out and submit,so that the prize amount can be credited into his or her account. 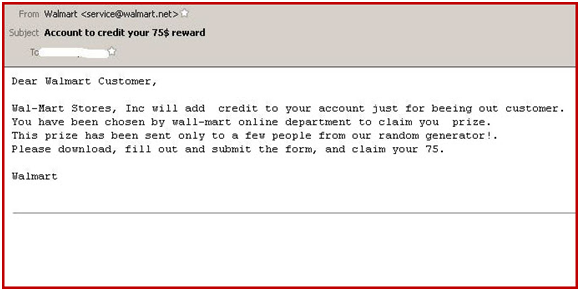 Of course, the message is not from walmart and there is no such prize of $75, as this is a fraudulent phishing scam attempting to trick victims into submitting their personal and financial information to the spammers. The bogus form asks for credit card details as well as other personal information including the user’s Social Security number. All of the information submitted via the fake form will be sent to the scammers who can then use it for credit card fraud and identity theft. Similar phishing scam emails have used the name of other high profile companies like McDonald’s,coca cola etc.. Earlier this year there was an SMS scam attempting to trick people into claiming a free $1000 gift card by leaving their personal details on website. Providing scammers with this type of information is very likely to lead to identity theft or credit card fraud. Be very cautious if you receive any email claiming to give you prizes or pay money into your account. Hi, I will look into this and see if there is anything we can do on our end. 4 notifications seems very excessive! Thanks for letting us know. Hi, I have looked into this, can you try to unsubscribe using the bottom link on the email? If you want to still be subscribed (but only get one email) you can resubscribe afterwards.